Like many of you, I imagine, my wife Susanne and I lead extremely busy lives. Home, family, and our passions (mine, the gallery, Susanne, her extremely successful floral design business), so with so much daily input from iPads, TV and social media from the early morning into the late evening, it’s so easy to disconnect from actually feeling life. 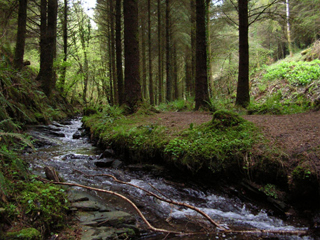 When we can organise it, we try our best to take a trip to Cardinham Woods with Totty. And when we do, something fundamental happens in those precious 90 minutes… we stop! Taking walks like this, where we’ll meet no one we know and have no ‘connection’ with anything but ourselves, seems to have a profound effect on us both. It’s like we reconnect. Not just with each other – which is essential of course – but with our inner selves. Finding a way to reconnect is so very important. It gives us a moment to reflect on whom we are and what we’d like to manifest in our lives. It seems so obvious… so simple… but it’s astonishing how little we make time to do just that. Our usual excuse is we just don’t have the time. But like exercise gives one energy, I believe taking time out and stopping makes the mind more efficient… making us more productive and gives more clarity to our commitments. With a very busy year ahead (more on that below), I for one intend to make a New Year’s resolution to stop more regularly: to take a breath and find a moment to reflect. Maybe you’d like to make a similar pledge? I believe these mini holidays for the soul have far-reaching benefits on everything we do… and for everyone around us. Input is essential and enjoyable, but so too is taking some time to process it. It’s like taking a deep breath of cool air. Well, I did promise to tell you what has been absorbing my downtime for the last 12 months. 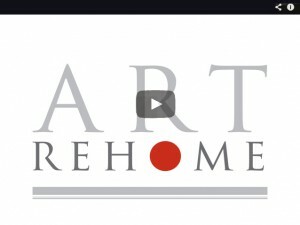 And so it’s with extreme excitement, I’m can now announce the launch of ArtRehome! So many people told me they wanted to refresh their artwork (or art they’ve inherited but don’t like) but didn’t know how to do this easily and safely. So I have created ArtRehome especially for that purpose… to aid the resale of pre-loved art in an easy, safe and accessible way. This website is, I believe, the first of its kind anywhere in the world and has cost tens of thousands to develop and a year in the conception, so I’m delighted that YOU, my smashin’ customers, will be the first to Beta Test it! Please be aware, this is only a Beta test; the site will go fully live at the end of January, so please feel free to use it and let us know if you find any bugs, please. OK, so how does ArtRehome work? Well, up to now, selling pre-loved art has been somewhat difficult and costly, either through traditional auction houses or unsafe online auction platforms. Through ArtRehome, you can sell your art from the comfort of your own armchair, allowing you to reinvest the in new art you’d love to own. What’s more, YOU decide the selling price and even the commission you want to give ArtRehome, using our fair-pricing policy! No provenance? No worries! ArtRehome has a unique Provenance Rating System allowing you to engage the artist themselves (or a gallery that knows their work) to provenance rate it for you for a small fee, giving you and your buyers confidence in it authenticity. I’m delighted there’s been a lot of excitement in the art fraternity for this unique new platform and there will be an article in the Telegraph on 31st January along with many other publications and blogs thereafter… but YOU are the very first to hear about it. So why not sign up and play with it? It’s completely free and you only pay a commission after you actually sell the works, so there are no up-front costs at all for listing your art! I hope this truly innovative global platform will be of help to you, your friends and/or colleagues. And if you want a small 90-second introduction before signing up, why not click on the video here (if you can stand listening to me dribble on any longer!) Any questions… you know where I am! For now, though, here’s to a great New Year for us all, and thanks so much again for all your support and custom throughout 2014. At this time of gift giving, it’s understandable that we rush into decisions about whom to give what. But just this month I was reminded of how the smaller things mean so much. 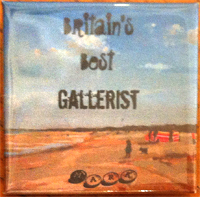 Right out of the blue I received this badge from the lovely Haidee-Jo Summers It had no real relation to anything, but because of that, it meant so much more than a normal thank-you gift would otherwise do. It reminded me of when, back in the 90s, I decided to give three people a small gift of gratitude, simply because their dedication to their work had moved me so much. I only knew one of these people personally, but when I gave my token of appreciation to all of them, the way they reacted was very similar to the way I felt this month; overwhelmed and deeply moved… read more.